You probably know about the importance of having healthy gut bacteria. It’s no surprise that keeping your gut in balance improves digestive health. But the ripple effects of having a healthy gut can be quite astonishing. It seems that researchers are finding new benefits almost daily. Having an imbalance in your gut bacteria can contribute to intestinal permeability. You may have heard people referring to this as “leaky gut.” And that’s a pretty accurate description. Toxins leaking out into the body and bloodstream trigger an immune response—inflammation. Inflammation is a necessary part of the immune system’s response to invaders. But you don’t want your body to be fighting constantly. It’s much better to keep toxins and other invaders out of the body in the first place. Normally, your digestive system helps move toxic waste out quickly. But leaky gut keeps that process from working effectively and keeping that waste contained. Eventually, those escaping toxins and the inflammation they trigger can affect the health of your entire body – all the way to your skin. Inflammation breaks down collagen, causing the face to lose elasticity. 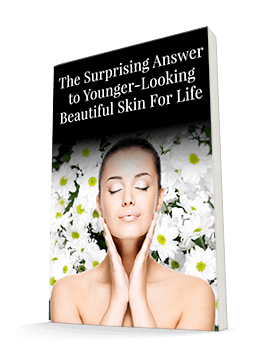 This creates wrinkles and sagging skin. Plus, it promotes redness and breakouts. So reducing inflammation and toxins can certainly benefit the skin. Having the right bacteria in your gut strengthens the intestinal wall. Bad bacteria contribute to leaky gut. Good ones help seal it up. But having the right bacteria in your gut can do more than just reduce inflammation. After all, we call them “friendly” bacteria, not “neutral” bacteria! In fact, several studies have linked strains of friendly bacteria to a variety of beauty benefits. Some help clear up acne. Others improve skin hydration and elasticity. Still others help the skin barrier function more effectively and clear up flakiness. To get these benefits, you need to have a variety of healthy strains of bacteria in your gut. And you need to not only introduce them to your gut but encourage them to move in for good. There are a number of factors that affect the microbiome. So clearing up your skin isn’t as simple as just popping a probiotic. For some people, that could help significantly. Others may need to significantly reduce the stress in their lives. And dietary changes will help most people. Most of the dietary changes that will help your gut aren’t surprising. Eat more whole foods, especially those that are rich in fiber. Keep saturated fat to a minimum. Eliminate as much inflammation-promoting sugar as possible. These changes alone will go a long way towards clearing up your gut and your skin. But there is more you can do. Researchers at Stanford Medicine have been looking at ways to promote different bacterial strains through dietary changes. And they’ve found something interesting that may help those of us in the West. Creating a healthy gut microbiome isn’t as easy as simply introducing the right kinds of bacteria to the scene. If it were, we could all just swallow a probiotic pill and be done with it. But the good bacteria need to stick around. All too often, they simply pass right out of the body. Researchers are trying to figure out how to get them to stay. They’ve discovered something interesting in their research with mice. It seems that adjusting the amount of a certain carbohydrate in the mice’s diet affects the growth of a friendly bacterial strain. And their findings could help humans make beneficial diet changes as well. The researchers first identified strains of the Bacteroides genus of bacteria that are able to digest a carbohydrate called porphyran. You may not have heard of this carbohydrate. And it’s possible you’ve never consumed it either. That’s because it’s found in a type of seaweed called nori. If you enjoy sushi or other Japanese foods, you’re probably familiar with nori. But if you stick with more typical American fare, you may never have tried it. And if not, you probably don’t have the bacteria that can digest porphyran in your gut. The researchers tried introducing nori-loving Bacteroides to the mice. They used three different mouse groups. One group had their own bacteria. In the other two groups, the researchers wiped out the mice’s gut bacteria. Then they replaced it with gut bacteria from two healthy human donors (one donor for each group). First, the researchers fed the mice a normal diet. Two of the mice groups were able to somewhat integrate the Bacteroides strain in their guts. Both the regular mice and one of the human-bacteria groups had limited success. But the population wasn’t robust. And the other human-bacteria group of mice totally rejected the Bacteroides strain. Then the researchers changed the mice’s diet to include nori. They thought that getting the mice to eat porphyran might help. And it certainly did. In fact, the results were so positive that they shocked the researchers. All of the mice were able to receive Bacteroides strain. The researchers could even manipulate the bacteria’s population size just by varying the amount of nori in the mice’s diet. The researchers were able to go on to genetically engineer other bacteria strains to digest porphyran. This means that simply eating nori could eventually make it easier for other friendly bacteria strains to set up shop too. The researchers are also going to continue investigating whether other diet/bacteria pairs exist. Their findings could make it much easier to determine the ideal diet for promoting bacterial diversity in the gut. For now, we know that consuming nori could make it easier for at least one of the Bacteroides strains to gain a foothold in the gut. That’s a pretty simple step to take to improve the health of your microbiome. If the idea of eating seaweed doesn’t appeal to you, this may not be very compelling. However, seaweed can offer a number of other skin benefits. Together, they might be enough to change your mind about this salty snack. First, seaweed is anti-inflammatory. Seaweed helps keep this immune response under control. This means it can help you avoid acne and other inflammatory conditions like rosacea. Second, seaweed is rich in vitamin C, which can help you rebuild collagen. Finally, if you still don’t want to eat seaweed, you can get some of the benefits by applying it topically. For example, it can function as an exfoliator and cleanser while delivering nutrients to the skin. It supplies niacin, which brightens the complexion and can reduce hyperpigmentation. You’ll even find seaweed in hydrating products for your hair. And some of the anti-inflammatory benefits work from the outside in as well. Of course, you can get the most benefit for your skin from seaweed by applying it topically and consuming it. Many natural hair and skincare products incorporate seaweed. In some products, seaweed is listed as algae, as it is a type of algae. Many of the Système 41 products include types of seaweed/algae. For instance, the Eye Serum, Night Treatment, and Day Crème all contain red algae extract. And more and more grocery and natural foods stores are carrying nori. You can enjoy nori as part of a sushi meal or on its own as a snack. You can even crumble it over savory dishes to add a pleasant salty flavor. Give it time, and it will help make your gut microbiome more welcoming to friendly bacteria. Gut health is tremendously important to the rest of the body – including the skin. Over time, the right diet can help ensure the “good guys” are winning out. Nori is a great addition to a diet that promotes a healthy microbiome and body.